Copyright © 2013 Bridget Sandorford; all rights reserved; content may not be copied, rewritten, or republished without written permission. You spend months searching for the perfect wedding dress, but then spend only a few hours wearing it. Its a waste of hundreds, maybe even thousands of dollars, and its a waste of yards and yards of fabric, lace, beading, and other embellishments. Of course, the dress made for some beautiful photos, but now that your big day is over, its just accumulating dust. Its an extravagant use of resources for something that served so minimal a purpose. There are a few things you can do with your wedding dress to ensure that it doesnt just sit in your closet for the next few decades, only to wind up in the landfill. Give It to a Relative. It used to be the tradition that women would hand their wedding dress down to their daughters to wear on their wedding day. That meant one less person buying a dress and one less dress being made, saving natural resources. However, that tradition has fallen out of favor as more brides have become interested in wearing the latest fashions. You can give your dress new life and save resources by giving your dress to a relative right after your wedding day is over—or within a few months or a year—instead of waiting years to pass it along to a hypothetical daughter who may or may not want to wear it. Give the dress to your cousin, your sister, your niece or anyone else in the family who is getting married and who would like to wear it. Clothing Donation. If you dont have any relatives or friends who are getting married any time soon, you can still give your dress to someone else who will wear it and help support a good cause. Consider donating your dress to The Brides Project, which allows brides to buy quality second-hand gowns to reduce their environmental impact. The money goes to support families who have been affected by cancer. You can also donate it to Brides against Cancer, which puts the gowns in a traveling show and raises money for families affected by cancer. Turn It into a Family Heirloom. With the yards and yards of fabric available on your wedding dress, you can make it into any number of other items. Some popular choices include a quilt, christening gown, pillow, or series of handkerchiefs. If you arent crafty enough to make these items yourself, hire a tailor to make them for you. Depending on how large your gown is, you may be able to make multiple items to keep for yourself or to give to family members. Restyling Wedding Attire. Theres no reason why you cant actually wear your gown again. You can have it altered or restyled so that you can wear it again for a fancy night on the town. You may be able to remove the sleeves, bring in the skirt, shorten the skirt, or even dye it another color. You could even turn your gown into separate pieces, giving you a bustier and a skirt that can be worn with other pieces in your wardrobe. Sell It. Why not make a little money back while you give your dress new life? You can sell your dress on sites like Ebay and Craigslist, and you may even be able to make back the majority of the money you spent on it, depending on when you sell the dress and the condition it is in after you wore it. Youll contribute to limiting the demand for the production of new dresses, and you'll make sure your dress gets additional usage. 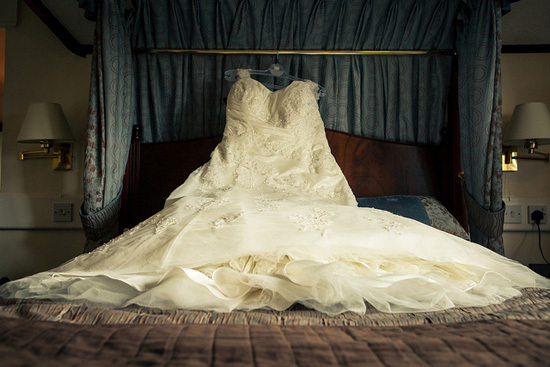 Dont let your wedding dress sit under your bed keeping company with moth balls. Help give it new life and new purpose so that the materials do not go to waste. Youll help reduce your environmental impact and make better use of your own resources. What did you do with your wedding dress after your wedding day? Tell us about it in the comments! Bridget Sandorford is a freelance blog and culinary writer, where recently she's been researching chef training schools. In her spare time, she enjoys biking, painting and working on her first cookbook. Jennifer Lewis knows that balancing studies with work and family life can be a juggling act, but with careful planning and time management it is possible to be both a mom and a student.